Last week-end roads should have been closed, snow, rain and strong winds kept everyone off their bikes and inside! This week-end … sunshine, blue sky, next to no wind! 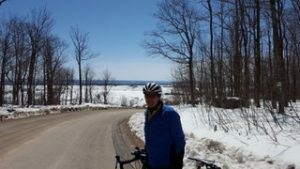 The Huron Chapter hosted the Kemble Rock 200, Saturday, 21Apr2018. 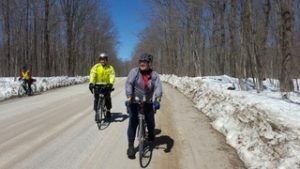 Congrats to Chris Cossonnet, Charles Horslin, Ken Jobba, Bill Little, Matthew McFarlane, John Maccio, Liz Overduin, Terry Payne and myself for successfully completing this ride! Special notice to Matthew McFarlane for completing his first ever Brevet!! Thanks to Matthew for helping me return my rear wheel to service after having my cassette go loose 11km into the ride! With a Campagnola wheel and a screw loose, it looked like I’d have to stop every ten km to re-adjust screw tightness … I didn’t have the tool I needed, Matthew did, so after mentioning using my Locktight … the screw stayed tight! Temperature went from -1 deg C to 13 deg C. Later in the day everyone was taking their cold weather gear off to prevent overheating! If you have never done this Brevet, I can only say the scenery is second to none. Here’s a photo of Ken Jobba stopping to take pictures just before the great descent down Kemble Rock Mountain. Here are Bill, Terry and Liz stopping to enjoy the view before their descent! My top speed down Kemble Rock Mountain has been with my wife on our Tandem at 84km /hr. On this ride, everyone had to pay attention as the roads had not yet been cleaned up after last week-ends weather! 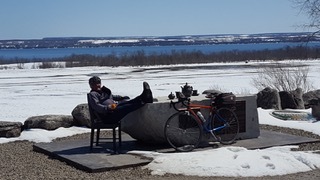 Heading towards Owen Sound, Bill Little decided to stop for some Tea! Everyone arrived at the Tim Horton’s in Owen Sound together for lunch and a well earned break before completing the last 90 km. It’s amazing how short the day seems when scenery, friends and cycling are together!